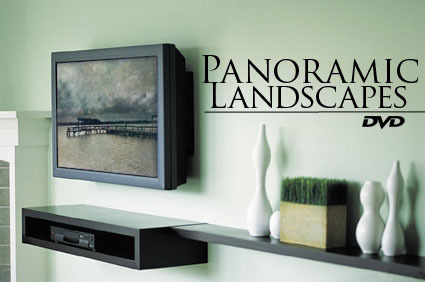 Turn any TV into a virtual work of art with the new, "Panoramic Landscapes" DVD. Produced by Art Image LA, the "Panoramic Landscapes" DVD features the constantly moving photographic works of Richard D'Amore. Enjoy dozens of subtly toned panoramic prints as they slowly pan and zoom on your display. It's the ultimate design item for today's modern home, and the perfect way to turn your high-end display into a constantly moving gallery of spectacular panoramic prints. Each print slowly pans to reveal the entire super-widescreen image. Perfect for entertaining and relaxing, turn any room into a virtual art gallery. Each print displays for two minutes before dissolving into the next print. The innovative pan and scan feature of each print allows you to experience every pixel of these extra wide panoramic prints. The DVD will loop indefinitely until the user presses stop. Select from an all new Classical music soundtrack or a soothing Ambient soundtrack. The DVD is mastered in Dolby Digital Surround sound for the complete Home Theater experience. The "Panoramic Landscapes" DVD creates the perfect soft, subtle, relaxing atmosphere with the muted tones of each photograph. Each still captures the awesome vistas of mother nature and her understated beauty. With a click of your remote control, select from a constantly moving, panning image OR a panoramic slideshow. The Panoramic Landscapes DVD is available now!